Melody knows thousands of words. She is pretty sure she has a photographic memory, and she has synthesthesia—to her, music has color and taste. But even though she's 10 years old, no one in her life knows any of this. She has never spoken a single word in her life and has no way of communicating to her teachers, parents or anyone else. Melody has cerebral palsy, making it impossible for her to move or speak. 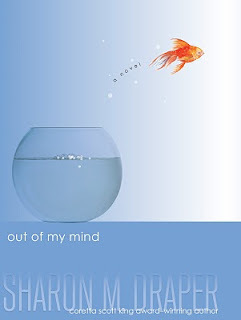 Sharon Draper brings us inside Melody's mind in this novel, told from Melody's own perspective. Her struggles, frustrations, and pain grabbed hold of my heart while I listened to Sisi Aisha Johnson's lovely narration. I became really invested in Melody and her family. I got angry when people treated her poorly, I got frustrated when people couldn't figure out what she wanted, I got sad when she knew she'd never be able to tell her parents with her own voice that she loves them. When bad things happen to anyone she loves, I got sad and sick with her. Often after I shut off the car to go to work, Melody's story stayed with me and I wondered what would happen to her when I finally returned to the story. But ultimately, this is a story of survival and of hope. There is help for Melody, and she and her family do their best to get it. Melody begins to integrate into the regular schoolrooms, not just in the special education classroom, and begins to be challenged in her schoolwork for the first time. And finally, she finds a way to communicate better than she ever has in her life, leading to a whole new set of challenges for her. Johnson does a wonderful job narrating. She sounded like a young girl, giving distinct voices to the different characters in Melody's life. She gives Melody a voice full of yearning and anger and sorrow and hope. Out of My Mind not only is a great book to read if you're looking for the perspective of someone physically disabled, whether you use it in a classroom or suggest it to a library patron, it also is just a great book to read, period. Disclosure: I checked this audiobook out from the library. hahahaha, I am LOVING that cover! =3 Goldfish are cute...anyways. Great review! This looks like a terrific book...it reminds me of Johnny Got His Gun. Have you ever read that? We had to read it in ninth grade English class. It was about a soldier who was horribly injured in a war (Vietnam, I believe) and lost his arms, legs, sight, and hearing. But he survived, and eventually figured out a way to communicate with the nurses who care for him. It was pretty powerful. Oh wow, no I've never read that one. I'll have to check it out, thanks for the rec! I hadn't heard of this book before! Sounds like The Diving Bell and the Butterfly for a younger reading group-- I think I'll be sending this to my cousin! Sort of like Diving Bell, but Melody has a wider range of motion and ways to communicate. Along the same lines, though. This was one of my favorite books from last year. One of the things I like about it is that everything didn't turn out all sunshine and roses for her with the other kids. It was much more realistic to me than total acceptance would have been, and it gives kids a real emotional connection that hopefully helps them understand how hurtful exclusion can be. I so have to read this! At the moment I am working at a kindergarten with disabled children and one of them is a little girl who can't speak or make a difference in her facial expression. She is looking very dreamily most of the time, focusing on nothing, but no one actually knows what disease she's suffering from, and I am wondering all the time whether she sees something we don't. Perhaps she's just like Melody, a clever girl who just cannot express herself? I thought Out of My Mind was phenomenal. I've never looked at a person with cerebral palsy in the same way since reading it, and now go out of my way to people I see with it because they always make me think of Melody. I wish all kids had to read this in school! Wow, this sounds like a really interesting read. I've always been curious about the perspective of people with these kinds of conditions. Thanks for the review! I read this one and absolutely loved it. Great review! Our principal raved about this book. Its on my to read list at the moment, so I'll get to it at some in the nearish future. Excellent review!